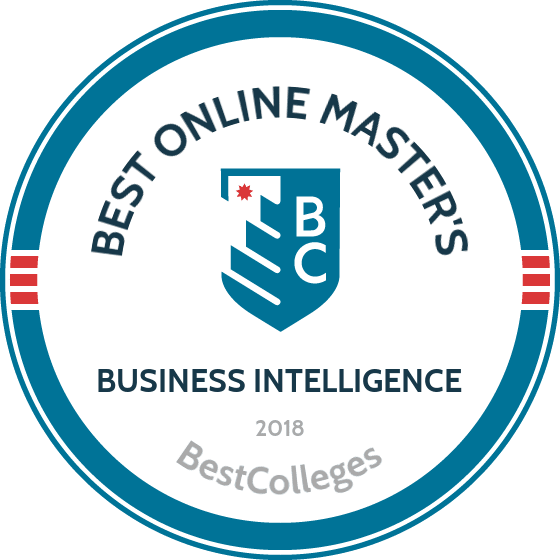 What are the Best Online Master's in Business Intelligence Programs? What Else Can I Expect From an Online Master's in Business Intelligence Program? Businesses rely on technology to operate efficiently, creating demand for innovative professionals with skills in data analytics and network security. The BLS projects the creation of 28,500 new positions in information security analytics by 2026. Earning an online master's in business intelligence helps professionals change careers or improve their analytical skills to expand their professional opportunities. Graduate degree holders are more likely to secure supervisory positions with higher earning potential. According to PayScale, entry-level business intelligence analysts earn an average salary of $63,000 per year, and professionals with 5-10 years of experience earn an average of $78,000 annually. Below, we discuss key features of the best MS in business analytics online programs. Students can complete Boston University’s master’s in business analytics in 18 to 24 months, with no in-person requirements. The program, offered by BU’s Department of Administrative Sciences, emphasizes hands-on learning through coursework in marketing, financial services, technology and product innovations, and operations. Students graduate well-versed in data and text mining, business simulations, visual analytics, and descriptive, predictive, and prescriptive modeling. The 40-credit master of science in applied business analytics comprises 10 courses in topics including financial concepts, operations management, and data mining for business analytics. Graduates qualify for careers as operations research analysts, statisticians, market research analysts, management analysts, and financial analysts. Online students in BU’s MS program benefit from the same opportunities as on-campus learners, including grants, graduate student assistantships, loans, payment plans, and scholarships. Located in Hoboken, New Jersey, Stevens Institute of Technology offers an MS in business analytics online. Students can complete the degree entirely online, with no on-campus requirements. The program helps students understand big data and the technology, and online learners gain skills in data mining, optimization, network analysis, social media, data interpretation, data warehousing, and data collection techniques. Students enrolled in the online master’s in business intelligence and analytics explore topics including financial decision making, experimental design, applied analytics in a world of big data, and knowledge discovery in databases. The program focuses on instilling expertise in four different areas: infrastructure, technical skills, professional skills, and disciplinary knowledge. Students can also add an optional concentration in data science, by taking 2-4 classes in the departments of mathematics, financial engineering, and computer science. The University of Colorado Denver/Anschutz Medical Campus offers an online master’s in business intelligence with a concentration in business intelligence. Available 100% online, the 30-credit program focuses on helping students make analytical tools and operational data relatable to decision makers in the business world. Topics include data visualization, customer relationship management, corporate performance management, advanced intelligence systems, and data warehousing. Students gain hands-on experience in a variety of cutting edge business intelligence tools. Distance courses explore text analytic and predictive modeling, business intelligence in healthcare, and information systems security and privacy. Online learners may also add an optional geographic information systems (GIS) certificate to their degree. Offered through the College of Engineering and Applied Science, the GIS option teaches students to develop intelligent GIS systems. Saint Joseph’s University in Philadelphia, Pennsylvania ranks among the first schools to offer an online business analytics master’s degree. Experts in the business intelligence and analytics industry designed the program, offered through the AASCB-accredited Erivan K. Haub School of Business. The program hosts the peer-reviewed International Journal of Business Intelligence Research. The online master’s in business intelligence and analytics at Saint Joseph’s includes four career-focused tracks for online students: data analytics, programming languages, cyber analytics, and general. In addition to the MS, graduates receive a business intelligence certificate from SAS, Inc. The curriculum includes courses in market intelligence, data-driven communication, online analytical processing, data warehousing, and data mining. Students can complete the MS in business intelligence and analytics at Saint Joseph’s in two years. Based in University Park, Pennsylvania, the business analytics master’s online from Pennsylvania State University - Main Campus prepares students to use data to make intelligent business decisions. Penn State’s 30-credit master’s of professional studies in data analytics includes an option in business analytics. The curriculum covers topics like data mining, predictive analytics, big data analytics, data management, and risk assessment. The program comprises nine core, nine business analytics, and nine elective credits, concluding in a three-credit capstone course. Distance learners may also take courses in applied statistics, marketing analytics, principles of demography, and technical project management. Prospective master’s degree candidates may first pursue a three-course, nine-credit graduate certificate in business analytics. Applicants to the master’s program can apply the credits earned in the certificate towards the master’s degree. Distance students can earn a business analytics master’s degree online at Arizona State University - Tempe, through the AACSB-accredited W. P. Carey School of Business. ASU’s MS in business analytics consists of 11 courses and 30 credit hours. Students can complete the degree in 16 months. Online classes last five weeks each, with students completing only one course at a time. Multiple enrollment dates throughout the year offer distance learners maximum flexibility. Students can complete the degree entirely online, with no in-person requirements. The 30-credit program teaches students to make data-driven analyses, extract value from data, and help businesses gain an advantage. Students take 24 required core credits and three elective credits, culminating in a three-credit capstone experience. Distance courses include data-driven quality management, statistics for managers, and data mining I and II. Maryville University of Saint Louis offers an online MS in business analytics through its John E. Simon School of Business. The degree suits both professionals working in the field and students without an extensive background in business analytics. Distance learners can complete Maryville’s MS in one year of full-time study or two years of part-time study. The fully online program offers three start dates per year. Applicants must submit a bachelor’s degree from a regionally accredited school with a minimum cumulative 3.0 GPA; the program does not require GRE or GMAT scores, or an application fee. The master of science in business data analytics emphasizes skills in data visualization, data mining, and data warehousing. Distance learners also learn how to use AZURE and Microsoft SQL, graduating prepared to take certification exams in these programs. The 30-credit program comprises nine courses and a culminating capstone experience. Based in Chicago, DePaul offers academic programs in the Roman Catholic tradition. The university's business intelligence master’s online, offered through the College of Computing and Digital Media, trains students to use a combination of statistics and technology to help businesses make strategic decisions. DePaul’s master of science in information systems includes a concentration in business intelligence. The program comprises 52 credit hours, typically spanning 13 courses. Students must earn a grade of "C-" or better in all courses and maintain a minimum 2.5 GPA throughout the program. Individuals with a 3.9 GPA or higher graduate with distinction. Students must complete a prerequisite course in data analysis and an introduction to IS management seminar before beginning the program. Required coursework culminates in a capstone experience. Located in its namesake city in Nebraska, Bellevue University offers an online master’s degree in business analytics. The 100% online program explores business administration, project management, computer information systems, and management information systems. Online and on-campus students pay the same tuition. Applicants must possess a bachelor’s degree from a regionally accredited school and a minimum 2.5 GPA in the last 60 credit hours of undergraduate coursework. Bellevue allows distance learners to earn industry recognized certifications including SAS Base Programmer and SAS Data Mining. The 36-credit program covers IT infrastructure, marketing and new media strategy, advanced data mining applications, and managing emerging technologies. Students enrolled in Bellevue’s master’s in science in business analytics learn to use data to create opportunities for businesses of all kinds. Graduates qualify for careers as financial analysts, human resources managers, and management analysts. The University of Alabama in Huntsville offers a master of science in management science - business analytics through its AACSB-accredited School of Business. The University of Alabama's business analytics online master's teaches students to use in-demand analytic techniques and tools to help businesses succeed. Course topics include predictive modeling, data mining, statistical analysis, and experimental design. The degree caters to working professionals looking to build advanced decision-making skills. The curriculum includes a business analytics practicum, providing real-world experience in the field. The 30-credit degree explores decision modeling, supply chain management, and introduction to econometrics. Students can start the program in spring, summer, or fall. Full-time learners can complete the degree in one year. Although curricula vary by program, the courses below are common to most online master's in business intelligence programs. The selected courses illustrate the variety of skills business intelligence students develop during their studies. While earning a master's in business intelligence online, students take courses that integrate business concepts and data analysis. Business Intelligence Foundations: This interdisciplinary course provides an overview of the field and introduces students to strategic and tactical levels of operation. Students explore topics in management information systems and customer service management to prepare for careers in management analysis. Data Mining: This course covers processes of data discovery through data pattern analysis. Students learn about machine learning algorithms, cluster analysis, and discriminant analysis. Students gain skills necessary to draft reports and articulate findings to corporate management and are prepared for careers in business and computer analytics. Risk Management: This course examines mathematical models used in risk analysis and provides skills necessary to address business issues, such as portfolio optimization and pricing. The course prepares students for careers in financial analysis. How Long Does It Take to Get an Online Master's in Business Intelligence? Most MS in business analytics online programs require 30 to 36 credits, and full-time students typically earn the degree within two years. Students without a background in business or technology may need to take additional foundational courses, which extends completion time. Additionally, program structure impacts the time required to graduate. Cohort-based programs are often highly selective and typically admit students once or twice per year. Students in these programs advance through the curriculum in small groups, completing courses and assignments together. Individually paced programs often feature start dates throughout the year, and students complete courses at their own pace. While students in individually paced programs customize their plan of study, they still meet deadlines and complete weekly assignments. Analytics Professional Certification: The Certified Analytics Professional credential improves professional opportunities and encourages continuing education. Master's-level candidates must have three years of professional experience. The exam comprises 100 multiple-choice questions. Management Consultant Certification: The Institute of Management Consultants offers this certification to assess technical skills, ethical conduct, and knowledge of management consulting. Candidates must have a bachelor's degree and three years of relevant work experience. In addition to a competency exam and oral review, candidates complete an ethics exam and oral interview. Students pursuing a business analytics master's degree online should look for accredited programs. The two major types of accreditation in the U.S. are regional and national. Regionally accredited schools comprise more than three quarters of the nation's colleges and universities and receive accreditation from one of six regional accrediting bodies. Nationally accredited schools often provide specialized education, such as vocational training, and typically offer lower tuition rates. However, regionally accredited schools generally accept only credits and degrees earned through other regionally accredited institutions. In addition to regional or national accreditation, students pursuing an online degree should look for accreditation from the Distance Education Accrediting Commission. Field-specific accrediting agencies, such as the Association to Advance Collegiate Schools of Business and the Computing Sciences Accreditation Board, promote high standards among MBA and STEM programs. The Council for Higher Education Accreditation (CHEA) and the Department of Education oversees the nation's accrediting bodies. With 3,000 participating universities, CHEA promotes quality assurance through recognition standards, which include measures of accountability, equality, and self-improvement. The Department of Education implements measures that require accrediting agencies to demonstrate the enforcement of standards by their accredited schools and programs. CHEA and the Department of Education provide databases of all recognized accrediting bodies in the country. The following table lists the top-paying states in the nation for computer and information research scientist positions. The BLS projects the occupation to grow nearly three times as fast as the economy as a whole; graduates from online business analytics master's programs will have career opportunities throughout the country. In addition to offering some of the highest salaries, Virginia is among the five states with the highest employment rates for computer and information research scientists. Students earning their business intelligence master's online take courses in business and IT to prepare for careers in industries such as healthcare, government, and software development. Many graduates pursue management positions in areas such as fund management and information security. Business intelligence professionals need strong analytical and problem solving skills to communicate effectively with interdisciplinary team members, stakeholders, and upper management. These managers actualize an organization's IT goals and oversee computer operations to improve efficiency. Earning a business analytics master's online allows professionals to transition into management positions without decades of work experience. Financial analysts facilitate sound investment decisions by examining money markets. These professionals evaluate financial data and economic trends and manage corporate portfolios to help companies seize opportunities while minimizing risk. These professionals ensure the safety of an organization's computer systems. Responsibilities include improving network impenetrability, developing innovative methods to protect data, and implementing security protocols. Earning a master's in business intelligence online improves a candidate's marketability for this position. Management analysts lead teams to develop solutions to organizational problems and to improve efficiency. These professionals may be self-employed or may work for a consulting firm. Some projects require management analysts to work with a team of specialized consultants. Management analysts with an online master's in business analytics often specialize in financial data analysis. Professional organizations allow students and recent graduates to connect with professionals in the field. Members have access to job listings, scholarly materials, and continuing education programs. Professional organizations often host annual conferences to address trends and issues in the field, and many organizations offer reduced membership fees for students. This professional organization promotes interdisciplinary collaboration to facilitate innovative approaches to computing research. Member institutions include higher education programs and private research facilities. The association provides access to a job forum, scholarly publications, and best practice memos. With more than 60,000 members worldwide, the IEEE Computer Society provides students, researchers, and IT professionals with networking opportunities. The society maintains more than 400 regional chapters and hosts more than 200 annual technical conferences. Comprising approximately 12,500 professional and student members, INFORMS emphasizes best practices in operations research and management science. The organization's mentor match program facilitates supportive relationships between emerging and experienced analytics professionals. The most common type of financial assistance is federal financial aid, including low-interest loans with flexible deferment options. To receive federal loans or participate in work-study programs, students must complete the FAFSA. Other forms of financial assistance include scholarships and grants, which do not require repayment. Students earning a business intelligence master's online can apply for field-specific scholarships, such as the Izenda Embedded BI and Analytics Scholarship. Students should check with their academic program for scholarship, grant, and graduate assistantship opportunities.